In this series, I'll be featuring some of my favorite bento blogger peeps - focusing on valentines/hearts/love posts, to help give y'all some inspiration with the holiday coming up! Diana of DianaRambles setup an amazing site called the BentoBlogNetwork. 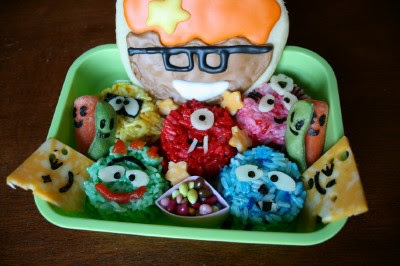 This became a great place to meet other bento makers, have fun weekly "contests" for Bento of the Week (based on a theme) and get tons of inspiration. I still feel like I should bow down to her bento skills everytime I look at this picture, lol, it's one of my all time favorites. All the little details of the characters, the colors, and the DJ Lance Rock cookie is so freaking fabulous! PAH-LEEASE check out her original post to this here - the pictures of her daughters are priceless! 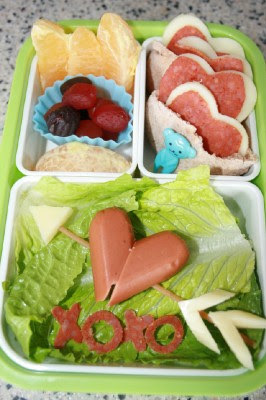 I particularly LOVE this "Bunny Love" bento for two reasons - 1) I love the adorable bunny cutouts for the cheese and on the pears. 2) Her husband had the GENIUS idea to use an egg mold (like the ones I use for shaped hardboiled eggs in Little Miss's lunches) to make a sandwich ball into a heart shape! So smart and so adorable! 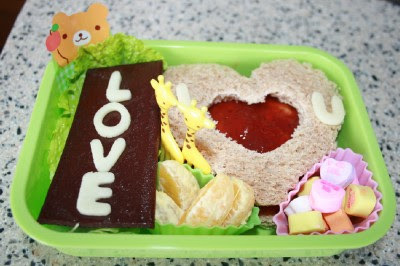 I love "peekaboo sandwiches" and Corey does not disappoint with this sweet "I Love You" bento. She made the "LOVE" sign from fruit leather and cheese. She also used cheese for the "I" and "U" around the peekaboo jelly heart in the center of the sandwich. A simple but fabulous idea to add some fun and color to a sandwich! 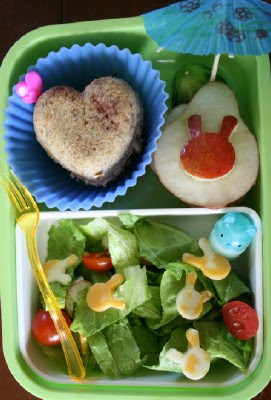 Corey's "Shot Through the Heart" bento has oodles of creativity! I adore the hotdog heart she made, holding together with a spaghetti noodle and cheese for the arrow parts. SO SO cute! The "XOXO" is made of pepperoni - YUM! The best part has to be the mini pepperoni and cheese pita sandwiches. HOW cute are those!? Pepperoni and cheese cut into heart shapes, tucked inside mini pita halves. Ahh, so fabulous! Chef Corey not only posts bentos, but FANTASTIC recipes! Each week she hosts a "Recipe of the Week" link up. Make sure to check it out at FamilyFreshMeals.com or on Facebook. I'm so glad you shared this, i missed that Shot Through the Heart bento! LOVELY! Thanks Candy Girl! As you can tell from the "not so hot picture" the Shot Through the Heart was from when I first started :) That probably why you missed it.